Chart to assist in following the discussion. By E.W. Hill, et.al., "History and Integrity of Thoroughbred Dam Lines Revealed in Equine mtDNA Variation," Animal Genetics 33, 187-294. London: Blackwell Publishing. For a brief description of the royal stud at Tutbury and a chart of some of Britain's royal rulers and early running horse breeders, visit here. Possibly a more relevant discovery applicable to the thoroughbred breeding industry today, is that through errors in reporting, recording, or some form of reasoned speculation in the GSB, the collective pedigrees of horses in eight of the nineteen families investigated were shown to have more than one haplotype. The results are unequivocal in this regard: different haplotypes mean different matrilines. Somewhere along the line, either distant, or more recent, the female descent of some mares were incorrectly recorded in the GSB, erroneously placing them and all their subsequent progeny beneath the wrong dam. Source: E.W. Hill, et.al., "History and Integrity of Thoroughbred Dam Lines Revealed in Equine mtDNA Variation," Animal Genetics 33, 187-294. London: Blackwell Publishing. For personal use only; otherwise, contact Blackwell Publishing. Note: Names and dates in brackets represent Thoroughbred Heritage corrections, and are not part of the originally published chart. 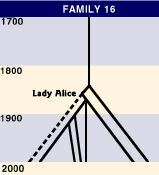 The Hill study identified four such errors in four distinct families, dating back no further than the late 18th century, and some much more recent. The study also identified deeper-rooted anomalies in three families, one of which may address the often-belabored historical argument regarding the close-inbreeding of the so-called Spanker mare of around 1690, great-granddam in female descent of the famous Flying Childers and his brother, Bartlett's Childers, the latter great-grand sire in tail-male descent of Eclipse. The "deeper-rooted" anomalies may date back to the first decade of the 18th century, or earlier, and so may affect a great many horses living today. In two families -- family 11 and family 12 -- a variant was found that differed from the other horses tested in the family, due to a single difference, or de novo mutation, in the DNA sequence, which probably have no bearing on the horses' matrilines. Family 16 is known as the Hutton's Old Spot Mare family, after its earliest recorded mare in the GSB,but was known long before Bruce Lowe as the Agnes Family, in recognition of one of its prolific 19th century daughters. Horses whose pedigrees placed them in this family were shown to genetically derive from two completely different founder mares -- one with the "F" variant mentioned earlier, and one with the "H" haplotype. Agnes was an 1844 daughter of Clarion, an undistinguished juvenile runner, and by age 3, a roarer. Nonetheless, she produced 13 live foals, many of them fillies of whom a goodly number were quality producers of enough class to establish their own strong branches of the family. The 1871 Macaroni filly Lily Agnes, an Agnes granddaughter, is one such example: she produced the undefeated English Triple Crown winner Ormonde (also a roarer) and 1,000 Guineas winner Farewell, and was grandam of the great race mare Sceptre. Family 16 Pedigree Tree, derived from "History and Integrity of Thoroughbred Dam Lines Revealed in Equine and MtDNA Variation," Animal Genetics 33: 287-294. ©Blackwell Publishing. The Hill study found that one of the eight horses analyzed from this family showed the "H" founder haplotype; the rest were from the "F" founder variant, joining the horses mentioned in Part II. Tracing the pedigrees in the GSB,each tested horse showed common female ancestors, starting with Hutton's Old Spot Mare, until Agnes' daughters were reached. 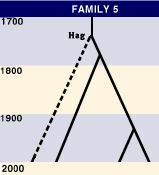 The descendants of her daughter Miss Agnes and one other daughter all displayed the "F" haplotype. However, the descendant of her daughter, Lady Alice, an 1855 filly by Chanticleer, was the horse whose genetic sequence displayed the "H" haplotype. Researchers could then conclude, based on this combination of molecular and historic analysis, that Lady Alice, or one of her tail-female descendants to the present, did not descend from Agnes, but rather from some as yet unidentified branch of the "H" matriline. Sometime in the past 150 years, the line of female descent appears to have been incorrectly recorded in the GSB. The only way to further pinpoint this error would be to test additional members of the Lady Alice branch of family 16, and so we must wait for further news regarding where the anomaly occurred. Lady Alice, as stated in the GSB,was in the stud of Richard Sutton, son of the well-known Quorn and Cottesmore Hunt Master Sir Richard Sutton. Richard Sutton, Jr., was prominent on the turf for a decade or so, having leased the Stockwell colt Lord Lyon, who won the Epsom Derby in 1866. Horses whose pedigrees in female descent that now may be in question, since they descend from Lady Alice, include such animals as the multiple German classic winner Ossian (1918), the 1928 1,000 Guineas winner Scuttle, and the important American sire Broomstick (1901). Tregonwell's Natural Barb mare (Family 1) dates to around 1670, and from the 1720s onward her descendants have produced some of the breed's best racehorses, in large part descended from the Duke of Grafton's famous mare, 1768 Snap daughter, Promise. Just a few of the important horses descending in tail-female from Tregonwell's Natural Barb Mare are those two pillars of the General Stud Book, the brothers Whalebone (1807) and Whisker (1812); the great racehorse and sire Bend Or (1877); Queen Bertha (1860); Canterbury Pilgrim (1893), dam of both Chaucer and Swynford; La Troienne (1926); Phalaris (1913), the most influential sire in the 20th century; Glencoe (1831), sire of the great broodmare Pocahontas, and influential sire of American broodmares; five-time Australian leading sire Star Kingdom (1946). Family 1 Pedigree Tree, derived from "History and Integrity of Thoroughbred Dam Lines Revealed in Equine and MtDNA Variation," Animal Genetics 33: 287-294. ©Blackwell Publishing. The Hill study found all but one the horses whose pedigress placed them in family 1 had identicial mtDNA sequence, in this case the haplotype "H." The one exception had a haplotype that matched those of the "F" matriline discussed in Part II. The anomalous "F" line, whose point of divergence was found in the same manner as that described for the Hutton's Old Spot mare (family 16) family, springs from a descendant of the 1851 Touchstone daughter, Glengowrie, whose dam, Glencairne, was a sister to the important sire Glencoe. A descendant of one of Glengowrie's daughters, along with descendants of other branches of family 1, had the same genetic sequence, haplotype "H." However, the single sample descendant of another daughter, Maid of the Glen (1858, by Goodwood Cup winner Kingston), had a different mtDNA sequence, the "F" haplotype. 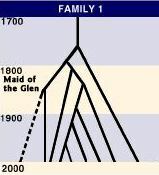 Maid of the Glen's line, then, is an anomaly, like that of Lady Alice in family 16; she, or one of her-tail female descendants to the present, did not descend from Glengowrie, and is not part of family 1, but, rather is part of that "F" matrline discussed in Part II. As with the other anomalies, pin-pointing the divergence will require testing of more horses from this family. A curious, and perhaps not coincidental sidenote regarding Maid of the Glen: she and most of her siblings were bred by the aforementioned Richard Sutton, in whose stud Lady Alice also resided. Horses descending from Maid of the Glen who might be affected by this discovery include the good Australian sires Bernborough (1939) and Todman (1954); Vimy (1952), influential in France, Ireland and Japan; and 1,000 Guineas winners Ma Biche and Waterloo, among others. Family 11, identified in the GSBas a "Sedbury Royal Mare" is first seen in the entry for The Pet Mare. The testing of the horses with pedigrees associated with family 11 has been discussed in Part II; two of the four horses tested showed the "J" haplotype, and therefore share the same founding mare as horses tested in Families 4 and 13. One horse in this family showed a de novomutation, that is a single difference in the dna sequence between it and the two that shared the "J" haplotype. The other horse showed haplotype "L," and was traced in pedigrees to the 1787 mare Young Camilla, by Woodpecker. Family 11 Pedigree Tree, derived from "History and Integrity of Thoroughbred Dam Lines Revealed in Equine and MtDNA Variation," Animal Genetics 33: 287-294. ©Blackwell Publishing. Young Camilla was the dam of the important broodmare Mandane (1800), from whom descend Oaks winner Manuella (1809), St. Leger winners Altisidora (1810) and Memnon (1882), U.S. Triple Crown winner War Admiral (1934), and the French-bred sire Zeddaan (1965). Somewhere, from Young Camilla to the present, there is a pedigree error in the GSB. Testing of other horses in this line will be required to more accurately pinpoint the anomaly. The "L" haplotype is shared with family 5, the Massey Mare (see below), therefore, some unknown number of horses along the Young Camilla line, previously attributed to family 11, actually share the same founder mare as the majority of horses tested in family 5. The fourth group of horses sharing matrilinear descent that has one horse with an anomalous haplotype tracing to relatively recent times belongs to family 19, called Davill's Woodcock Mare. This mare like other early mares, is just a name listed in a short pedigree prior to the entry of the first mare in this line entered in the GSB,a mare by Wood's Counsellor, sometimes called "Sister to Thunderbolt," Thunderbolt being a well known racehorse foaled in 1723. This is the family of U.S. champion 2 year old and later good sire, Never Bend (1960), and further back Isonomy (1875) -- sire of two English Triple Crown winners, Common and Isinglass -- and Isonomy's son, Gallinule (1884) who was twice leading sire in England. From the names associated with the early pedigrees of this family, it's probable it, as so many other early families, was developed at the D'Arcy stud in Yorkshire. Family 19 Pedigree Tree, derived from "History and Integrity of Thoroughbred Dam Lines Revealed in Equine and MtDNA Variation," Animal Genetics 33: 287-294. ©Blackwell Publishing. Of the seven horses purportedly descending from family 19, six showed the "K" haplotype, which is thus far unique to this family, and is not shared with any of the other horses tested in the Hill study. One, however tested with another unique (thus far) variant, labeled "O." Going back to the pedigrees in the GSB,researchers determined the earliest point where the divergence could have occurred would have been with the 1858 mare Violet, by Epsom Derby winner Voltigeur. Three 2,000 Guineas winners descend in the maternal line from Violet -- Gorgos 1902, Nebbiolo (1974), Surefoot (1887). 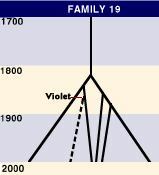 As with the other anomalies discussed above, the error in recording a female pedigree could have occurred any time, from Violet to the present. And, as with the other questions the study raises, we will just have to wait for further revelations in future studies of mtDNA. One deep-rooted anomaly occurs far back in family no. 9, which traces back to the Vintner mare, who probably dates to the 1670s and was, in the words of a later racehorse breeder, "the best bred as well as the best runner of her day in the North." Her breeding was unknown until the 1920s, when C. M. Prior discovered a note regarding her pedigree in the 18th century stud book of Cuthbert Routh, which records the Vintner mare as a daughter of the Curwen Arabian. Her granddaughter, a mare by (Old) Spot, c. 1690, produced six recorded foals in the GSB,all probably born in the first decade of the 18th century, including three daughters, all by the Curwen Bay Barb. Family 9 Pedigree Tree, derived from "History and Integrity of Thoroughbred Dam Lines Revealed in Equine and MtDNA Variation," Animal Genetics 33: 287-294. ©Blackwell Publishing. 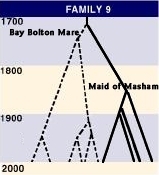 The Hill study found that four of the ten horses sampled from family 9 had a common ancestor in the sturdy race mare Maid of Masham, an 1845 daughter of Don John. She traces back to the Curwen Bay Barb daughter commonly called "Sister to Mixbury number one." These four horses all carry haplotype "A," a unique variant in all the horses tested in the study. Their descendants include such horses as Cyllene, *Star Shoot, his son Sir Barton, Bold Forbes, Bull Lea, Tom Rolfe, and Ack Ack. Six horses tested in family 9 had a different haplotype labeled "G." They all trace back to an unnamed mare by Bay Bolton, born in 1728, often referred to as Sister to Sloven. The GSB shows this mare to be a daughter of another unnamed Curwen Bay Barb mare, commonly called Sister to Mixbury number two. Somewhere, between the founder line that leads down to the 1845 Maid of Masham and the line that leads to the unnamed 1728 Bay Bolton mare, a mis-recording of the dam line occurred, and researchers believe it was probably earlier, rather than later in the line. Because the "G" haplotype was also found in family 12 (a Royal Mare), it appears that many, if not all of the Bay Bolton mare's progeny, formerly thought to be part of family 9, share the same founding mare as those tested in family 12 instead. Horses carrying this anomalous "G" variant from family 9 include all horses descending from that extremely influential early 20th century mare, Mumtaz Mahal (1921), known as "the Flying Filly," and considered one of the fastest two-year-olds of all time. That would include such familiar names as Nasrullah and his full sister Rivaz (1943); Royal Charger; Abernant; Mahmoud; Risen Star; and Shergar. These "G" variant horses, the Hill study shows, derive from the same founding mare as the three tested in family 12, a Royal Mare, whose pedigrees were traced back as far as a 1723 mare by Greyhound, who, according to the GSB, was a daughter of a mare by the Curwen Bay Barb. Three extremely significant stallions, and many more influential horses, descend from the family 12 founding mare, and thus probably carry the "G" haplotype: they are Eclipse (1764), Lexington (1850), and Commando (1898). Because questions have been raised by historians regarding Eclipse's dam line, and because Lexington's dam line was considered so ill-documented by the GSB at the turn of the 20th century that he and all but a few of his descendants were barred from entry in the GSBin 1913, additional testing of more horses descending from family 12 will be of great interest. The early breeding of mares in family 6 has been the subject of discussion among Thoroughbred historians since the GSBwas first published. This is the family of the Old Morocco Mare, "sometimes called Old Peg," according to the GSB, "...out of Old Bald Peg, who was got by an Arabian, out of a Barb mare." Old Peg was bred at the Helmsley estate formerly belonging to George Villiers, that favorite of James I. Helmsley was given to Lord Thomas Fairfax in 1651 for his services to Oliver Cromwell during the Civil War. It reverted to Buckingham control when the second Duke married Fairfax's daughter in 1657. Family 6 Pedigree Tree, derived from "History and Integrity of Thoroughbred Dam Lines Revealed in Equine and MtDNA Variation," Animal Genetics 33: 287-294. ©Blackwell Publishing. According to the GSB, Old Peg produced Spanker, "the best horse at Newmarket in Charles II's reign," and three daughters, one of whom was recorded as a filly by Spanker, Old Peg's son, making her inbred 2 x 1 to her dam. This filly had two daughters through whom most of family no. 6 descends, one called Cream Cheeks and the other Betty Percival, both by the Leedes Arabian. The Hill study was only able to test three horses from this family. 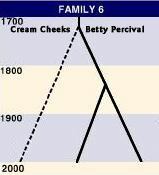 Two of them, who traced back in female line to Betty Percival had the "C" haplotype, and one, who traced to her supposed sister, Cream Cheeks, had a different haplotype researchers labeled "N." Cream Cheeks, then, had a different dam from Betty Percival, based on this very small sample population; testing of more individuals will be required to confirm the anomaly, but it lends credence to material unearthed by historian C. M. Prior, which some subsequent historians have been loath to embrace. Some historians have had no problem believing late seventeenth century horse breeders would plan or allow such inbreeding. There are, after all, a few other examples of this sort in the GSB. This particular breeding, however, is attributed to James D'Arcy, who was a sophisticated and highly influential breeder of running horses. Prior found evidence in the stud book of Cuthbert Routh which refutes the accepted inbreeding, at least in regards to Cream Cheeks. Routh's stud book gave the pedigree of Flying Childers, who springs from this family. That pedigree stated Flying Childer's grandam [Cream Cheeks] was by the Leedes Arabian and out of a "famous roan mare of Sir Marmaduke Wyvill's." Wyvill's stud was less than ten miles from that of Routh, and there is ample evidence they knew each other well. This roan mare is a mystery, since, as far as we know, she is not recorded in the GSB, and no further historic information has come to light regarding her, other than one small tidbit Prior also unearthed. He found that there was a "Wyvill Roan" mare in the Duke of Devonshire's stud at the time of his death in 1729, when an inventory was taken of his horses. Devonshire owned Flying Childers, both as a racehorse and as a stallion. Thus it appears that Cream Cheeks may trace, as the Routh stud book said, to this famous roan mare, who, according to the mtDNA study, appears to have no relationship to Old Peg. The genetic sequences do not negate the inbreeding of the Spanker mare as far as Betty Percival is concerned, and perhaps the inbreeding dispute as it relates to Betty Percival will remain unresolved. Should the two different genetic sequences be confirmed by future testing of other individuals that spring from Cream Cheeks and Betty Percival, horses who have descended from these different mares can no longer be considered related. Those who belong to the Betty Percival maternal line, still presumed to descend from Old Peg, include * Diomed, Grey Sovereign, Selene (dam of Hyperion, *Sickle, and *Pharamond II). Those who descend tail-female from Cream Cheeks, and may not descend from Old Bald Peg at all, include Flying Childers and his more influential brother, Bartlett's Childers, great-grandsire in male line descent of Eclipse, and U.S. Triple Crown winner Count Fleet. Both mares have many English classic winners among their descendants. The Massey mare (Family 5), c. 1700, is listed in the GSBas the dam of Old Ebony (1714) and her sister, Brown Betty (1713), both bred by John Manners, 1st Duke of Rutland. Brown Betty ran in a trial match, timed by the both the Duke of Rutland and the Duke of Devonshire, over three miles against the famous Flying Childers and a horse named Almanza sometime around 1719-20, in which Flying Childers, owned by Devonshire, supposedly made record time. The Manners, as Earls of Rutland, had been breeding running horses since the mid-sixteenth century, their horses known as the famous "Belvoir strain;" Belvoir Castle, Leicestershire, was the Rutland seat, and the family had a long-established stud at Grantham in Lincolnshire. Most historians consider the Massey Mare descended from the Belvoir horses, long established in England, and not descended from any "royal" mare belonging to any of the Stuart kings. Family 5 Pedigree Tree, derived from "History and Integrity of Thoroughbred Dam Lines Revealed in Equine and MtDNA Variation," Animal Genetics 33: 287-294. ©Blackwell Publishing. Four horses whose pedigrees trace back to the Massey Mare (family 5) in the GSBwere examined, and three were shown to carry haploytpe "L." One had another variant, "M," which is unique among the horses tested in the study. The horse with the "M" haplotype traced to the 1745 mare, Hag, a grand-daughter of Old Ebony, andtherefore very close to the earliest recorded pedigrees for this family. Her GSB recorded dam, Ebony, probably carried the "L" haplotype, since the other three horses tested who descend from Ebony carry the same variant. It appears that Hag and/or her descendants may derive from a completely different, and as yet unidentified mare, who would have been part of the 2nd Earl of Portmore's stud, where Hag and her progeny were bred. All the offspring of her supposed dam, Ebony, were also bred by Charles Colyear, 2nd Earl of Portmore, who was a favorite of George II and served as the superintendent of royal horses running at Newmarket. The Earl had mares lodged at a number of farms in England, and undoubtedly relied on the owners or managers to record the progeny of his widely scattered mares. The "L" variant was also found as an anomaly in family 11, which researchers determined could trace back as far as Young Camilla of 1787; there is no doubt that Young Camilla or one of her descendants in the female line, and all the subsequent progeny, are of the same matriline as most of the horses tested from the Massey Mare family. If additional testing of these two branches of family 5 confirm the dual matrilines extending that far back in the pedigrees, a great many horses' pedigrees will need to be reconsidered. Those still associated with family 5 via the "L" haplotype include the French-bred winner of the English Triple Crown, Gladiateur (1862); the great grey ghost, Native Dancer (1950); the mare Rough Shod (1944), whose descendants include the great English sire Sadler's Wells (1981) and the excellent sire Nureyev (1977); the 1898 mare Doris, and her son, dual-classic winner Sunstar and daughter, Epsom Oaks winner Princess Dorrie; the descendents of Oaks winner Miami (1844), including English Triple Crown champoin Galtee More (1894), the good racehorse and sire Djebel (1937), and American horses Swing On (1926), Equipoise (1928), and the great Seabiscuit (1933). Those from the Hag line, who probably do not share the same haplotype as the horses mentioned above, include such animals as the important sire Doncaster (1870), sire of Bend Or; the great broodmare sire, Epsom Derby winner Hermit (1864); all horses descending from the important broodmare Harpsichord (1918), including Oaks winner Masaka (1945), Epsom Derby winner Kahyasi (1985), Belmont Stakes winner and sire Gallant Man (1954), Kentucky Derby and Belmont Stakes winner Needles (1953), and St. Leger winner Son of Love (1976). There is ample evidence that the Irish Hobby, a strain first developed in Ireland well before 13th century, was imported into and used in England and Scotland for various activities, including racing, "...they be so light and swift." 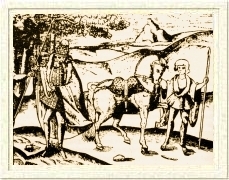 In Cavelarice,[The English Horseman...] (1607) author Gervase Markham, who later sold an Arabian or native-bred Arabian to King James I, said, "...when the best Barbaries that ever were in my remembrance were in their prime, I saw them overrunne by a black hobbie at Salesburie of Maister Carlton's and yet that hobbie was more overrunne by a horse of Maister Blackstone's called Valentine, which neither in hunting nor running was ever equalled, yet was a plaine-bred English horse by both syre and dam." One intriguing discovery in the Hill study was the "L" haplotype in three of the four horses tested in family 5, The Massey Mare. She was owned by the Earl of Rutland, whose family had been breeding running horses at least as far back as the early 16th century. Historians have long considered the Rutland "Belvoir" strain to be derived from mares long-native to Britain, and not any imported from the "Orient." When compared with other equine mtDNA studies, the "L" haplotype matched with that of a celtic pony, and when placed in a phylogenetic tree in the study, the "L" haplotype is located nearest a horse population derived from Europe--Connemara, Shetland, Lippizan and Belgian haplotypes. [See Figure 2, in the Animal Genetics article]. Considering the long span of time represented in the phylogenetic tree, no conclusions can be reached. But in light of the indications in the historic record regarding the Rutlands -- and another early horse breeding family, the Fenwicks (some of whose horses were listed in the 1649 inventory of the Tutbury royal stud) -- and the use of native horses in early races in Great Britain, the genetic sequence information may, at least, suggestion confirmation of the historic record. ©Copyright Patricia Erigero, 2002 - 2005. All Rights Reserved. May not be reproduced without permission.